For the ancient Greek comedy, see The Birds (Aristophanes). 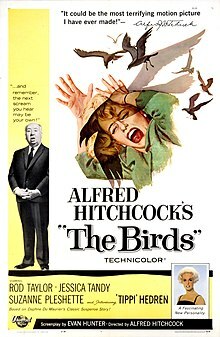 The Birds is a 1963 film about a small California town where birds of all kinds suddenly begin to attack people, in increasing numbers and with increasing viciousness. Directed by Alfred Hitchcock. Written by Evan Hunter, based on a short story by Daphne du Maurier. I think we're in real trouble. I don't know how this started or why, but I know it's here and we'd be crazy to ignore it... The bird war, the bird attack, plague - call it what you like. They're amassing out there someplace and they'll be back. You can count on it... Unless we do something right now, unless we get Bodega Bay on the move, they... Mrs. Bundy said something about Santa Cruz, about seagulls getting lost in a fog and then flying in towards the lights... Make our own fog... we can use smoke pots the way the Army uses 'em. I'm neither poor nor innocent. [as she sees a man lighting his cigar as gasoline is leaking around him] Look at the gas, that man's lighting a cigar! Annie Hayworth: This tilling of the soil can become compulsive, you know... Well, it's something to do in your spare time. There's a lot of spare time in Bodega Bay. Lydia Brenner: I wish I were a stronger person. I lost my husband four years ago, you know. It's terrible how you, you depend on someone else for strength and then suddenly all the strength is gone and you're alone. I'd love to be able to relax sometime. I'd love to be able to sleep... I'm not like this, you know, not usually. I don't fuss and fret about my children. When Frank died, you see, he understood the children, he really understood them. He had the knack of entering into their world and becoming part of them. That's a very rare talent... Oh, I wish, I wish, I wish I could be like that. I miss him! Sometimes even now, I wake up in the morning and I think: 'I must get Frank's breakfast.' And I get up, and there's a very good reason for getting out of bed until, of course, I remember. I miss talking to him. Cathy's a child, of course, and Mitch, well, Mitch has his own life. I'm glad he stayed here today. I-I feel safer with him here... Don't go. I feel as if I don't understand you at all and I-I want so much to understand... because my son seems to be very fond of you and I don't know quite how I feel about it. I don't even know if I like you or not... Mitch is important to me. I want to like whatever girl he chooses... Well, I don't think it's going to matter very much to anyone but me... Mitch has always done exactly what he wanted to do. But, you see, I don't want to be left alone. I don't think I could bear to be left alone. Oh, forgive me... This business with the birds has upset me. I don't know what I'd do if Mitch weren't here... I wish I was stronger. Mrs. Bundy: Yes, sir, I recall it. The town was just covered with seagulls... A large flock of seagulls got lost in the fog and headed into the town where all the lights were. And they made some mess too. Smashing into buildings and everything. They always make a mess. Mrs. Bundy: The point is that no-one seemed to be upset about it. They were all gone the next morning just as though nothing at all had happened. Poor things. Mother in diner: [to Melanie] Why are they doing this? Why are they doing this? They said when you got here, the whole thing started. Who are you? What are you? Where did you come from? I think you're the cause of all this. I think you're evil. EVIL! Cathy Brenner: He's got a client who shot his wife in the head six times. Six times, can you imagine it? I mean, even twice would be overdoing it, don't you think? Cathy Brenner: (crying) When we got back from taking Michelle home, we heard the explosion and went outside to see what it was. All at once, the birds were everywhere. All at once, she pushed me inside and they covered her. Annie, she pushed me inside. Radio newscaster: In Bodega Bay early this morning, a large flock of crows attacked a group of children who were leaving the school during a fire drill. One little girl was seriously injured and taken to the hospital in Santa Rosa, but the majority of children reached safety. We understand there was another attack on the town. But this information is rather sketchy. So far, no word has come through to show if there have been further attacks. Radio newscaster: The bird attacks have subsided for the time being. Bodega Bay seems to be the center, though there are reports of minor attacks on Sebastopol and a few on Santa Rosa. Bodega Bay has been cordoned off by roadblocks. Most of the townspeople have managed to get out, but there are still some isolated pockets of people. No decision has been arrived at yet as to what the next step will be but there's been some discussion as to whether the military should go in. It appears that the bird attacks come in waves with long intervals between. The reason for this does not seem clear as yet. Melanie: Have you ever seen so many seagulls? What do you suppose it is? Mrs. MacGruder: Well, there must be a storm at sea. That can drive them inland, you know. Mitch: [deliberately mistaking Melanie for a sales clerk] I wonder if you could help me? Melanie: Just what is it you're looking for, sir? Mitch: Yes, I understand there are different varieties. Is that true? Melanie: Oh yes there are. Mitch: Well, these are for my sister, for her birthday see, and uh, as she's only going to be eleven, I, I wouldn't want a pair of birds that were too demonstrative. Mitch: At the same time, I wouldn't want them to be too aloof either. Melanie: No, of course not. Mitch: Do you happen to have a pair of birds that are just friendly? Mitch: Doesn't this make you feel awful... having all these poor little innocent creatures caged up like this? Melanie: Well, we can't just let them fly around the shop, you know. Mitch: No, I suppose not. Is there an ornithological reason for keeping them in separate cages? Melanie: Well certainly, it's to protect the species. Mitch: Yes, I suppose that's important, especially during the moulting season. Melanie: That's a particularly dangerous time. Mitch: Are they moulting now? Melanie: Some of them are. Mitch: How can you tell? Melanie: Well, they get a sort of hang-dog expression. Mitch: We met in court... I'll rephrase it. I saw you in court... Don't you remember one of your practical jokes that resulted in the smashing of a plate-glass window? Melanie: I didn't break that window. What are you, a policeman? Mitch: No, but your little prank did. The judge should have put you behind bars. I merely believe in the law, Miss Daniels... I just thought you might like to know what it's like to be on the other end of a gag. What do ya think of that? Melanie: I think you're a louse. Melanie Daniels: So you're a lawyer. Melanie Daniels: Do you practice here? Melanie Daniels: What kind of law? Melanie Daniels: Is that why you want to see everyone behind bars? Mitch Brenner: Oh, not everyone, Miss Daniels. Melanie Daniels: Only violators and practical jokers. Melanie Daniels: It's very beautiful. Annie Hayworth: I guess that's where everyone meets Mitch. Mitch: Well, small world...How do you know Annie? Mitch: So you came up to see Annie, huh? Mitch: I think you came up to see me. Melanie: Now why would I want to see you of all people? Mitch: I don't know. You must have gone to a lot of trouble to find out who I was and where I lived. Melanie: No, it was no trouble at all. I simply called my father's newspaper. Besides, I was coming up anyway. I've already told you that. Mitch: You really like me, huh? Melanie: I loathe you. You have no manners, you're arrogant, and conceited, and I wrote you a letter about it, in fact. But I tore it up. Melanie: On Mondays and Wednesdays I work for the Travelers Aid at the airport. Annie: Well, you needn't worry. It's been over and done with a long time ago. Melanie: Annie, there's nothing between Mr. Brenner and me. Annie: Isn't there? Well, maybe there isn't. Maybe there's never been anything between Mitch and any girl. Annie: [after birds attack the children at a party] That makes three times. Mitch: Last night? What do you mean? Melanie: A gull smashed into Annie's front door. Mitch - what's happening? Melanie: [on the phone] Oh Daddy, there were hundreds of them... Just now, not fifteen minutes ago... at the school... the birds didn't attack until the children were outside the school... crows, I think... Oh, I don't know, Daddy, is there a difference between crows and blackbirds?... I think these were crows, hundreds of them... Yes, they attacked the children. Attacked them! Deke: Mrs. Bundy, you don't seem to understand. This young lady said there was an attack on the school. Drunk: 'It's the end of the world.' Thus sayeth the Lord God unto the mountains and the hills, and the rivers and the valleys. Behold I, even I shall bring a sword upon ya. And I will devastate your high places. Ezekiel, chapter six. Waitress: Woe unto them that rise up early in the morning that they may follow strong drink. Drunk: Isaiah, chapter five. It's the end of the world. Mrs. Bundy: I hardly think a few birds are going to bring about the end of the world. Melanie: These weren't a few birds! Deke: I didn't know there were many crows in Bodega Bay this time of year. Sebastian: How many gulls did you count, Mrs. Bundy?... The ones that have been playing devil with my fishing boats... Oh, a flock of gulls nearly capsized one of my boats. Practically tore the skipper's arm off. Mrs. Bundy: The gulls went after your fish, Mr. Sholes. Really - let's be logical about this. Melanie: I think they were after the children...to kill them. Mrs. Bundy: Birds have been on this planet, Miss Daniels, since Archaeopteryx, a hundred and forty million years ago. Doesn't it seem odd that they'd wait all that time to start a...a war against humanity. Salesman: Your captain should have shot at them... Gulls are scavengers anyway. Most birds are. Get yourselves guns and wipe them off the face of the earth. Salesman: Kill 'em all. Get rid of them. Messy animals. Mrs. Bundy: ...probably contain more than a hundred billion birds. Drunk: It's the end of the world. Sebastian: Those gulls must have been after the fish. Boy: Are the birds gonna eat us, Mommy? Mrs. Bundy: [explaining that birds of different species never flock together] The very concept is unimaginable. Why, if that happened, we wouldn't have a chance! How could we possibly hope to fight them? Lydia: When do you think they'll come? Lydia: If they're bigger birds, Mitch, they'll get into the house. Mitch: Well, it's just a chance we'll have to take. Lydia: Maybe we ought to leave. Mitch: No, not now. Not while they're massing out there. Mitch: We'll just see what happens. Lydia: Where will we go? Lydia: What happens when you run out of wood? Mitch: I don't know. We'll break up the furniture. Lydia: You don't know. You don't know. When will you know? When we're all dead?! [Cathy bursts into tears] If only your father were here! [pause] I'm sorry. I'm sorry, Mitch. Cathy: Mitch, can I bring the lovebirds in here? Cathy: But Mom, they're in a cage! Lydia: They're birds, aren't they? Mitch: Let's leave them in the kitchen, huh, honey? Mitch: We don't know, honey.